This morning I had the opportunity to check out a brand new form of video camera called Mevo with my friend and colleague, Jeff Herring. Essentially it’s like having a TV studio at your fingertips using their camera and your mobile device (as of the time of this post iPhone and iPad only so far; Android users, once again, you’ve got to wait your turn!). The reason for today’s demo was two-fold. First, Jeff Herring and our other buddy Mike Stewart have been telling me for the past few weeks about this exciting new game-changer camera called Mevo. Jeff wanted to show me how it works and how easy it is to set up. Second, Jeff Herring and Mike Stewart have a Live Video Secrets training they do, which has step-by-step info and tutorials on using and profiting from Facebook Live and other live video sources for your business. They are constantly updating the course as new technologies come and go (we said buh-bye to my friend Blab this week, while Google announced Google Hangouts were also going to be replaced by something they are rolling out on YouTube soon). 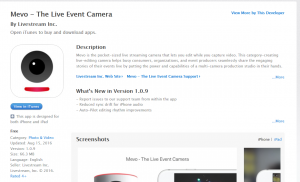 With Mevo being the game-changer that it appears to be, Jeff and Mike wanted to get this new segment of training with their existing demos, screen shots, videos, and training related to Live Video. (yep – all that is an affiliate link. You guessed it!). To be clear: I was only the guest in this situation. I do not yet have my Mevo camera, but I will be getting one (you can get yours at Amazon here using my affiliate link, so I can make lots of money and continue to pay for all the food my teenager is eating these days!!). I wish I had captured a screen shot of what I could see from my end, because it was less than exciting! 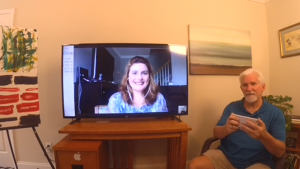 LOL As the guest, I was talking via Skype video feed to Jeff. I was in my office in Knoxville and he was in his office in Atlanta. Nothing new there; that technology has been around for over a decade, along with the ability to record it. So on my screen all I saw was what the camera from Jeff’s laptop on his desk was pointed at: a bad angle looking up at his nose and ceiling beyond! Not too flattering for anyone. But he wasn’t worried about that because as you can see from the screen capture above, that’s not what anyone else saw other than me. That means, Jeff was the only one with the fancy cool new camera. So he set up the camera where he wanted it, fired up the Mevo app on his phone, pictured here on the iTunes store, and hit record. He could then easily zoom in to whatever he wanted. One option was to have just me on screen, which he had plugged in via HDMI cable from his computer to his big screen monitor. He could also be just him on screen, if he wanted to. Another option was to zoom out to include us both in the shot – like in the photo above. And finally, if there had been a third person sitting with Jeff in the same room, he could have zoomed in on the third person alone as well, and included that person in the wide shot. NOTE: There was no one else in the room with Jeff. It was his Mevo camera set up on a tripod and being controlled from his iPhone to get all the shots in the video (available with the training here). Looking at it now, it seems like there must have been someone else doing the recording. That’s the beauty of it: no extra camera operator required to get all those shots! What I like about it is it seems very user friendly and makes your camera work go from a ho-hum static (boring) shot to TV production quality with a finger tap on your mobile device’s screen. Another feature, which we did not use today but I have seen used, is Mevo can directly broadcast to Facebook Live in addition to making a local recording. That’s where the live TV studio part comes into play. What I didn’t love was that as the interviewee, my audio wasn’t as crisp as if I had been in the studio/Jeff’s office. It was fine and more than good enough, but that is one part that wasn’t TV production broadcast quality – unless you consider when TV broadcasters interview someone over Skype – then this audio was AT LEAST AS GOOD as that, if not better. On my end I was using a better quality microphone (a Blue Yeti – there are a few higher quality versions and a few lower quality, but I use this mic for my voice over work and all my clients have been happy). I think if Jeff had plugged in some higher quality speakers than what is standard in his computer laptop, we could have made the sound quality better than good enough. However, that wasn’t the purpose of today; it was to do a quick demo and show me the wonders of this new technology. In summary, overall I think the Mevo camera is worth the $399 retail price (at Amazon, anyway). You will be able to do A LOT with the camera with you alone or with another person in the room, as well as using it for interviews with someone through your computer. Remember when the internet was new and people who jumped on it made a lot of money? Well, the same thing happened decades earlier with TV, and before that radio, and before that with movies. You know how much money there is in the broadcasting industry and online. Now, it’s YOUR turn to jump in early on a technology that combines the best of both worlds: broadcasting and the internet and get your share of that delicious pie of new technology excitement and success. You can do all that very affordably from your own home office. Jump in now. This is the sound of opportunity knocking! Have you tried Mevo yet? Been interviewed with one? Watched one? What are your impressions? Please share below in the comments your thoughts on this new technology.